We’re conservators. The explanation at a bar usually goes something like this: We fix old stuff. Well sometimes it’s not old. And sometimes we don’t fix it. No trust me, it’s fascinating. Actually once I really explain what I do, most people see the appeal. We work on old things, pretty things, ugly things, rare things, historically important things; we use technology and tools borrowed from other professions to solve problems you might not have thought about. And at West Dean, most of us work on objects that serve a function. Readers of books generally want their books to open; owners of clocks want them to tell time. We balance the value of the object as a historical artifact against the requirements for its use. We try to make repairs as minimally interventive as possible, and reversible if necessary. We do our best to prevent further damage. We’ve learned that in time we often find a much better way of doing what we once thought was a great idea, and that objects mundane in one time period may be interesting and rare in another. To that end we study chemistry, physics, art history, craft, conservation theory and ethics, in addition to practical work. 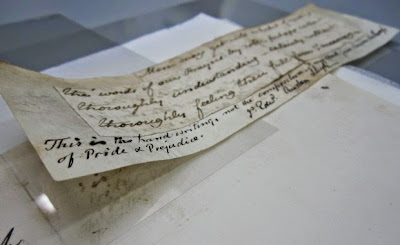 We thought, with the kind permission of our clients, we would share some of our work with you, in hopes that when you meet a conservator in a bar you can immediately say—and mean it—ah yes, how fascinating. It is fascinating. Topics include: a Jane Austen manuscript, making iron gall ink, removing tape from an 18th century binding, making paring knives for bookbinding, and restoring an organ clock.